Saudi Arabia’s Pan Gulf Welding Solutions (PGWS) is confident its recently revamped technical services segment will help boost revenues and raise its profile as a supplier of welding-related products, machine tools and services. The company’s Pan Gulf Technical Services (PGTS) was revamped earlier this year with the addition of new services. This subdivision of PGWS has already bagged five contracts. PGWS has also made gains in the UAE market; its machine tools segment has proved to be “a step in the right direction” and a new cranes segment has been added, said the company’s general manager, Sayeed Khan. 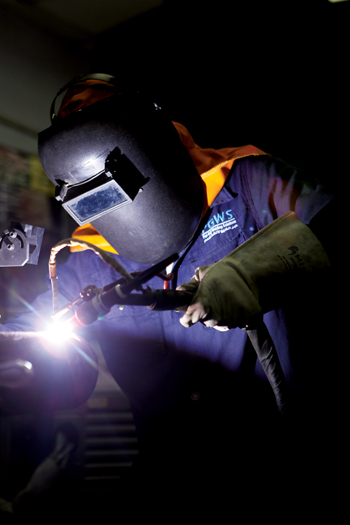 “PGWS has grown to be one of the leading suppliers for welding equipment and services in the Middle East; its Dubai operation is showing positive growth and creating space for itself in the UAE market,” said Khan. PGWS, based in Al Khobar in the Eastern Province, is part of Pan Gulf Industrial Investments Company (PGIIC), and has operated in the business of welding, cutting, machine tools and cranes for more than a decade. The revamped PGTS provides a new channel for revenues. It has partnered Lonestar Welding Australia and specialises in providing automatic and manual welding services and the supply or hire of automatic welding equipment for customers in the oil, gas and water industries. “We develop weld procedures from conception through to final acceptance on highly technical welding projects as we believe welding is the single-most critical activity in the construction of a pipeline,” said Khan. “PGTS, in its earlier form, was started only for heating services mainly post-weld heat treatment and performed directly under PGWS. When we introduced pipe welding and beveling services, we restarted PGTS this year as a sub division of PGWS which already had Aramco approval,” said the official. Discussing the new PGTS, its general manager Ron Barker, said the industry had been clamoring for a pipeline constructor to come and take the small projects that larger firms would not want to do. “At a time when automatic welding of pipe lines was almost mandatory we saw there was a gap in the market for companies still using the manual welding process and who did not want to go ahead with the expense of installing new automatic welding robots and employing operators,” noted Barker. Some details about the five contracts won by PGTS were provided by its project manager, Jaya Kumar. One was an in-workshop project, three jobs related to pipelines ranging from 26 km to 30 km and one was for a new refinery project for welding heavy wall thickness pipes of differing diameters. ”We are also carrying out Post Weld Heat Treatment (PWHT), pipe cutting and beveling as part of our site services. We have a large range of beveling machines and good experienced staff to carry this out. The new TIP TIG process has allowed us to be very competitive on labour-intensive projects where heavy walled pipes are welded and require a TIG root run. This semi-automatic process is about 500 per cent faster than the normal manual method,” said Kumar. He highlighted that Pan Gulf Technical Services offers a good welded joint rate. 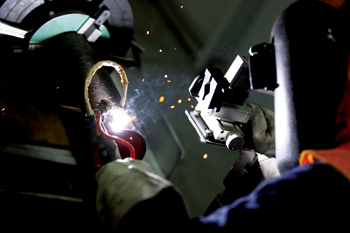 As they are only there to do the line-up and the welding of the pipe, they keep their staff and overheads to a minimum. In the field it means a very big saving. Barker commented that “we are already looking to expanding our equipment base as we are currently quoting on 14 projects in three different countries and in varying quantities and pipe sizes, some of which we will win. By this time next year we will have over 30 robots and 130 staff. Not bad for a company that only commenced welding pipes this year”. Khan listed some of the fast-moving equipment PGWS sells. 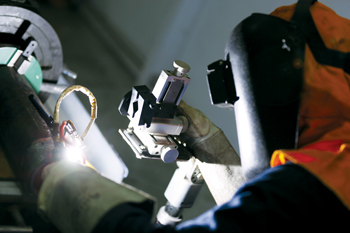 These include the Esab Warrior, a robust inverter technology multi-process welding package; Caddy Arc/TIG, a compact and portable inverter for MMA and TIG; Magnatech, whose equipment is specialised for the orbital pipe, tube, tube-sheet and pipeline welding system using the GTAW, FCAW and GMAW welding processes, and the Chester Radial Drill, which is a range of drilling machines from small Hobby bench drills through to radial drilling machines. Among other successful products that PGWS sells is the MVD bending machines range. These are designed and analysed with 3D-supported computer aided programmes and are precisely machined in moving column CNC machine centres. Also doing well is the MVD shearing machine whose body and upper beam are made of steel. It has been designed according to minimum stretch and optimum resistance criteria. The company also highlighted its Chester machine tools and products from Cuteral Imas as well as Faccin circular shears, automatic flanging machines, hydraulic presses, automatic manipulators and global plate-handling systems. The new cranes segment at PGWS refers to the company’s appointment as a distributor for India-based Electromech, which specialises in designing, selling, manufacturing, erecting and commissioning a diverse range of products in the industrial cranes product spectrum. ElectroMech supplies a variety of cranes and hoists in capacities ranging from 80 kg to more than 200 tonnes across different industry verticals including automobile, steel, power, shipbuilding, heavy engineering, fabrication, and general engineering. Cranedge, an initiative of Electromech, provides post-sales services to overhead crane users. It has a knowledge bank on a variety of cranes along with applications and products to optimise crane efficiency. “We had been doing cranes for the last two years but were buying and trading from our Indian office. There was no distributorship, a separate team and service capabilities. This year we started with a proper distributorship of Electromech and people on the ground for both sales and service. We classify this as a new vertical in our business,” said Khan.